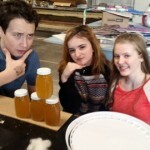 The Food and Farm Lab students worked hard during the first trimester to harvest the honey from our two Harley bee hives, process it, develop a brand and marketing strategy, and then sell their delicious product: jars of Honey Be Mine honey! 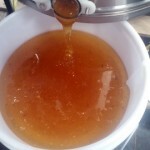 Roughly eleven gallons of honey yielded about 175 8oz jars to sell. Friday morning was the time for the sale, and the savvy students made themselves available to the “captive” crowd gathered that morning, waiting to enter the Theater to see Pageant. 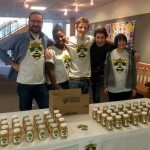 About 80 jars went to the Harley faculty from pre-sales and another 80 jars were sold Friday morning. Each of the students in the class took home a 12 oz. jar of the golden goodness. 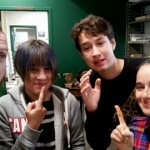 This entry was posted in Commons in General, Micro-farm (HOG), The Bee Hive, Uncategorized. Bookmark the permalink. 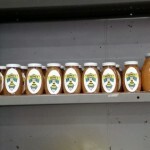 Is there any more honey for sale? I think there are a few jars left. Please email Ja’Daiza Johnson directly (jjohnson@harleyschool.org), as she was in charge of the inventory. Good luck!